Diyaa raking the trail on Earth Day. Why is this project important to us? When we were in elementary school our teacher used to take us on walks on the school nature trail. We had lots of fun walking through nature. It was a good way to refresh ourselves before going back to class. On these walks we learned some names of the common trees of our area and nicknamed our favorite spots. 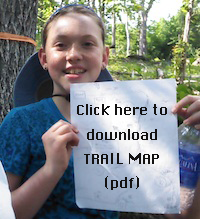 For a school project we measured and mapped the trail. In 2013 forest management came through and harvested mature trees in the forest, in the process our nature trail was destroyed. We want people to access nature easily again. After getting permission for this project from our community leaders we designed our new trail. Laying out the new bridge with our advisor, Safiyya. We spent many hours planning and organizing our project. 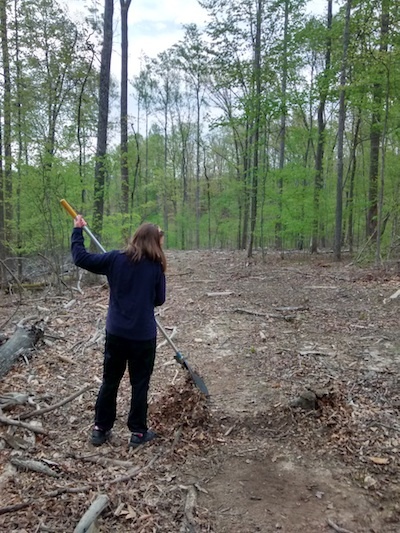 On Earth Day, we raked the proposed trail in our design. A WCEC alumni, Hameed, helped us by doing some crucial heavy-duty clearing and chain sawing. 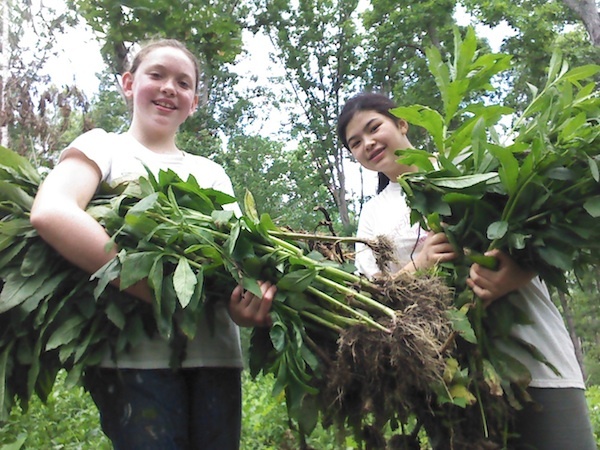 In early June, during their summer school, the Upper Elementary students helped us line and weed the trail. Over the course of our project, we (Hanan and Diyaa) did over 20 hours of weeding, raking, and lining the trail with logs. We found out that making a trail is VERY hard work, but with all this help and teamwork, it was possible to complete this project. 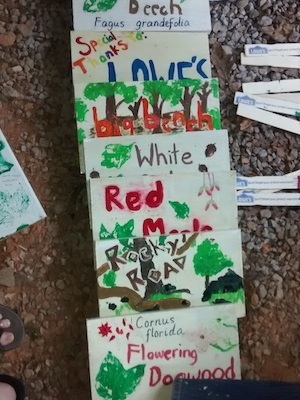 We got a donation of wood and paint for a small walking bridge and signs from the Bedford Lowe’s store. With the help of our advisor, Safiyya Palmer, we selected interesting, common tree specimens along the trail. 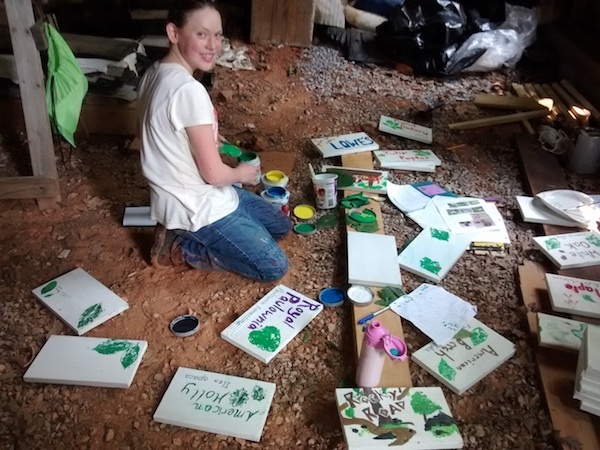 We then designed and painted 20 signs including 13 tree identification signs. 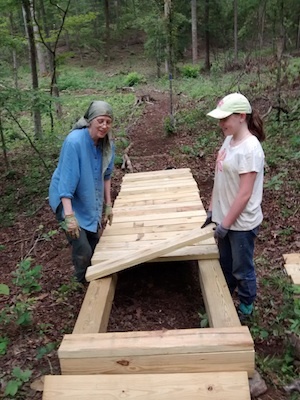 We carried supplies to the proposed bridge site, and laid out the support timbers for the bridge. Hanan’s Dad helped us nail the bridge together. 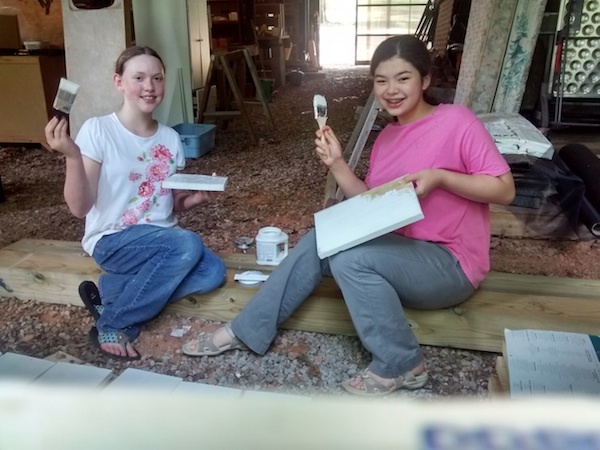 Another WCEC friend and supporter, Mary Helmig, organized a morning Trail Building Workshop for a near-by international summer program, the Global Youth Village (GYV). Shaykh Ahmed Abdur Rashid, founder of our school, Farah Symons, Principal, and Jehan Bradley, Community Manager, for permission and support for this project. 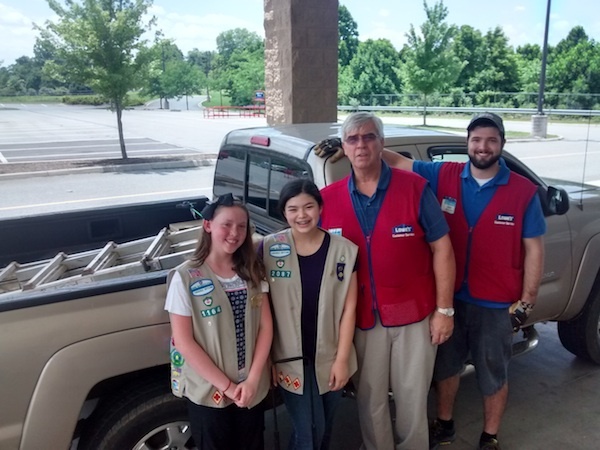 Bedford Lowe’s,for the generous donation of supplies. Mary Helmig,Program Director for the GYV volunteer Trail Building Workshop. Teachers and Students of the World Community Education Center (WCEC) for your valuable volunteer work. Safiyya Palmer, for being our Project Advisor and for all your essential ideas and help. Hameed, WCEC alumni, for your generous time and labor. 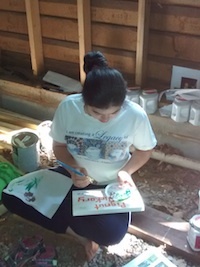 Our Girls Scout Troop leader, Amy Spangenberg. To the Girl Scouts of America for giving us this opportunity. And to our families, for all your help, support, and ideas! It is a wonderful and amazing thing seeing an idea become a reality. At first, we thought doing 50 hours of work would be impossible, but doing this big project, we found it easy. It was a great experience for us to plan and organize this project. Everyone has their talents and we hope we used ours in the best way. We both learned lots about being leaders and planners and hope we developed these new talents. We hope this project benefits our community and inspires others to Take Action! SCROLL DOWN TO SEE MORE PHOTOS OF OUR PROJECT! 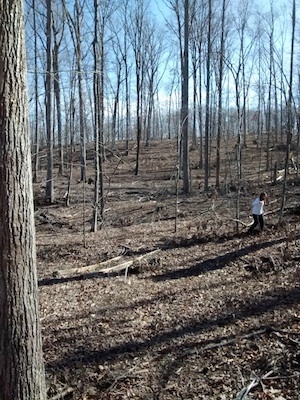 BEFORE: Diyaa exploring the land behind WCEC and designing the new trail. 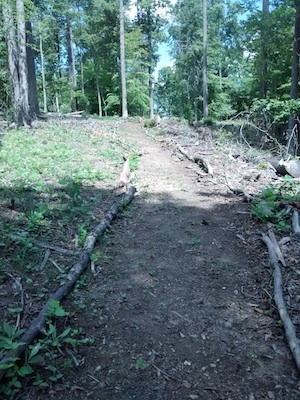 AFTER: Lining the finished trail. It looks great! 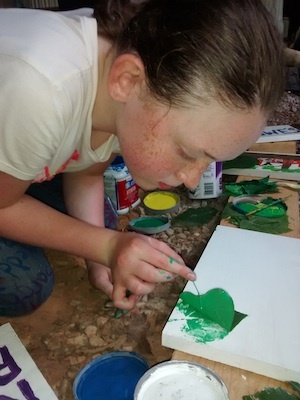 We put real leaf prints on the tree signs! The first finished signs! Let’s rejoice! 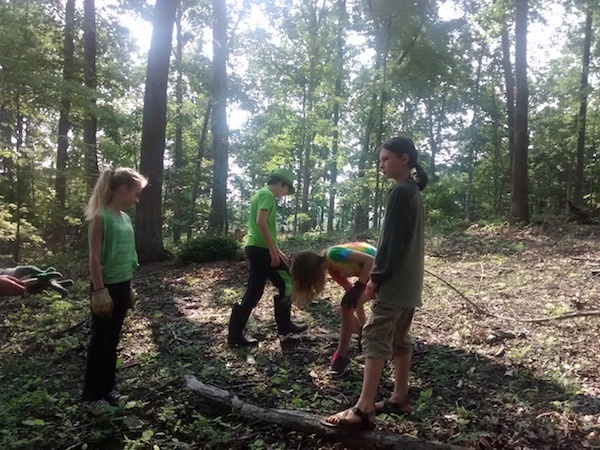 Upper Elementary students helping us line the trail. Picking up our donation from Lowe’s. Thanks again! Nailing the bridge planks on with Hanan’s Dad. 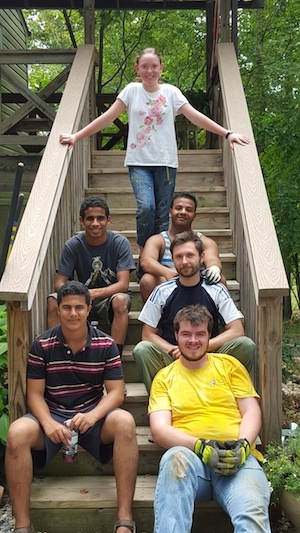 The Global Youth Village volunteers . Thanks for your help. Pulling weeds off the trail! They kept growing all summer. Congratulations Girls! What a wonderful project and achievement! Thank you! Thank you for all the pics showing the process and work… and the MAP! That is so helpful…I had always wondered where it was…I think I might take a walk out that way now…look forward to your Trail Opening! What a wonderful project! Not only have you created a lovely recreational venue, but you have nurtured and strengthened so many community ties in the process. Brava to girl power! 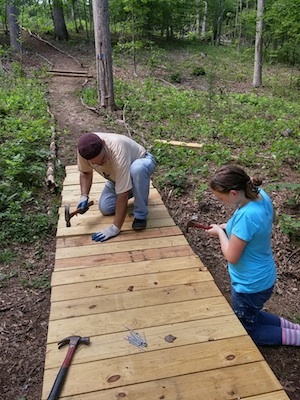 This is on par with a Boy Scout Eagle project which they must complete to get their highest rank. It is a big deal and says something significant about your maturity and character. I’m very proud of you.